Gregory Peck’s redoubtable Atticus Finch commands the courtroom, setting the bar for lawyerly dress. Alan’s pale pink and rich brown ensemble is a model of understated elegance, with subtle details like a horizontally striped shirt and gauntlet suit cuffs marking him as a sartorialist, but not a dandy. Trustworthiness - Whether being appraised by a judge, a jury, a client, or a senior partner, a lawyer’s attire should give an open and honest impression. This translates to well-tailored but simple, sober clothes that don’t attract attention to themselves, but rather serve the wearer by focusing attention on his or her face. The bolder patterns or brighter colors that an entrepreneur or an entertainer might favor with will tend to come across as flashy, distracting, and perhaps even suspicious when worn by counsel. Thoroughness - Tailored clothing presents many opportunities to demonstrate one’s attention to detail. Nuances like a precise trouser break or a properly knotted necktie are subliminally impressive to even the least sartorially inclined among us; their mastery won’t come across as fussy or fogey, but rather refined and authoritative. 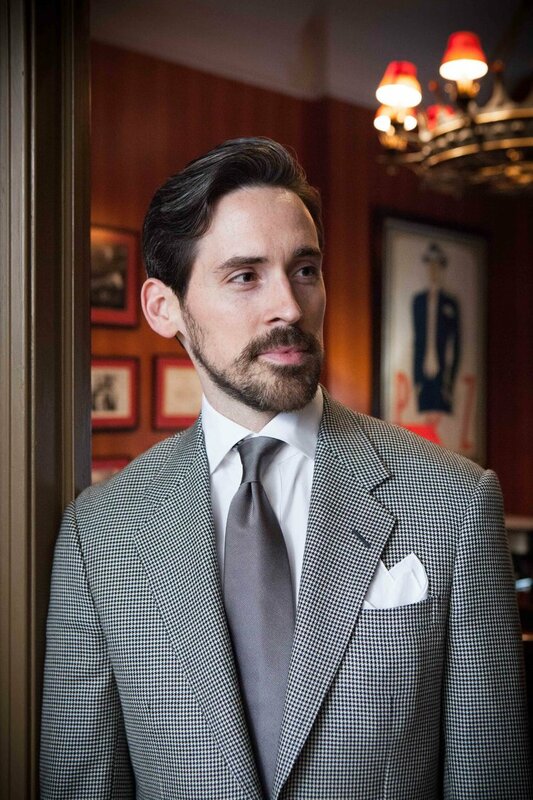 A discrete pocket square is a polished touch, (especially in the increasingly common absence of a necktie) but it’s generally well-advised to steer clear of more fastidious or anachronistic details like collar pins and braces — at least until you’re more established in your career. Gravitas - A lawyer’s attire should respect the seriousness of the law he or she practices, and the magnitude of the stakes for clients. A well-cut solid dark suit, a crisp white or light blue shirt, and an elegant tie is an admittedly formal but entirely appropriately ensemble to wear to what is essentially one of the highest ceremonies in secular society: a court of law. Not quite the white wig required in British courts, but the same idea: symbols of continuity that transcend whims of fashion. Jonathan’s houndstooth suit is sober yet lively, and completely appropriate for the courtroom. NOTE: Alan Flusser Custom will be exhibiting at the New York State Bar Association’s Annual Meeting at the New York Hilton Midtown from January 15th through the 17th.